My Brother and I just started playing EotE and I was wondering, can't we just steal Armor off of a dead Stormtrooper instead of buying some? And what is stopping him from stealing weapons and vehicles and equipment? Nothing physically. Whether a GM wants to bust your chops when you're seen walking around with likely stolen gear is their prerogative though. Well nothing except that Imperial armor and weapons are distinctive even if you paint over the armor. So pretty much anywhere your characters go in the galaxy, especially anywhere within the Empire or the Outer Rim they are going to at the very least raise some eyebrows but more likely get them arrested. Even selling Stormtrooper armor is a dangerous proposition, weapons and vehicles less so because it's likely there is a surplus market but I wouldn't even risk trying to sell that armor, and wearing it is basically an invitation to get targeted by any Imperial. Donate those stolen Imperial weapons and armor to the rebellion for covert actions. Maybe they have something to trade for it that you would like to have. Use the crafting rules and modify the appearance. Or just use and ditch it. Have fun. 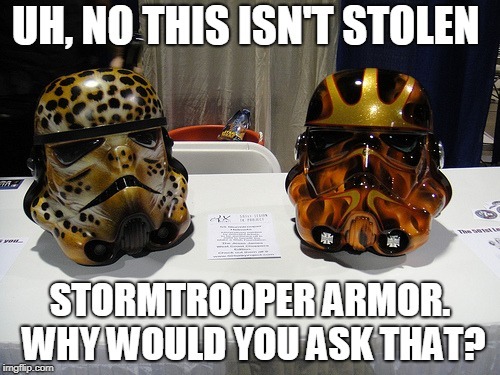 I usually make a point of heavily modifying the appearance of anything blatantly illegal, such as Stormtrooper armor, pretty much as soon as I get it for exactly this reasons people have already brought up in this thread. Otherwise, I consider anything from enemies to be free to take after a fight assuming any of it is still functional and make a point of taking everything I can hold and the GM gives me time to grab. I may require checks for some things though, like mechanics checks to hotwire speeders and such. To elaborate on the posts above: You cannot buy Stormtrooper Laminate Armor. You can buy other kinds of Laminate armor (which are just as good, but look alot different). So, yes you can steal Stormtrooper Armor, but wearing it makes you a prime target for the empire just as much as selling it to anyone outside the Rebel Alliance would. In the same time, it would lead to interesting situations for you, if you opt to run around in full stormtrooper armor with helmet on; "Solider, what are you doing here, where is your unit? What is your ID?" etc. No, you can buy storm trooper armor (and TIE fighters, and even Star Destroyers), just not through legal channels. What I was trying to say is, that the Laminate Armor listed in the Armor Section in most cases does not represent Stormtrooper Armor (It sure can be Stormtrooper Armor) but most Shops would offer different models of Laminate / Composite Armor and not Stormtrooper Armor. (Unless as you said, you're at a less-than-legal shop). The way I see it, it's easy come easy go. There will be times when the blaster is knocked from your hands and there isn't enough action eco to stop and pick it back up. Or your armour is ruined with a double T, or an item slips from your grasp as your navigating through a chase scene. To me, equipment isn't really part of the players character anymore then Han Solo's blaster; sure we now made it a weapon with several layers of history but back then it was just a blaster, if he ended up having to run and pick something up in the heat of the moment then that wouldn't surprise me either. My character has a small armoury of various blasters but only because I expect to lose each of those at some point or other. In regards to stripping armour; it's probably worth noting that for most part that takes a fair amount of time. Stripping a body of it's armour plates then it's body glove that was worn by the previous inhabitant, it aren't quick work so I would factor it into any time challenges they have. Worked for Luke and Han's purposes because they weren't in any rush, might not necessarily work in an ongoing battle with the law, where lingering around a scene invites authoritarian retribution. Otherwise, the main question is time and expectations and it's worth having a conversation with your DM about it. Is this a campaign where paychecks are made by looting the dead? Or is he expecting something a bit more? my group personally by large doesn't really allow looting of armour; largely because it feels so murder hobo that it's counter productive to our professional Rebellion commando theme, partly because we are largely wearing stuff that's better unless we have a scheme that requires a set of uniform. Personally, I prefer to make up schemes to con and steal vaults then to conduct theft. No not at all. Why would anyone ask that? They obviously aren't educated in the ways of "Storm Trooper Armor inspection"